If you decide to employ an outside agency such as Keel Over to manage your PPC campaigns you will need to allow Analytics and AdWords account access in order for your PPC campaigns to be efficiently managed. Here is a step by step guide on how to do that. Sign into your Analytics account. Under Add Permissions for, enter the user’s email address, for example for Keel Over you would add: keeloveranalytics1@gmail.com. Select the permissions you want. In order to effectively manage the account an agency such as Keel Over would usually request all permissions (Manage users, Edit, Collaborate and Read and Analyse). Usually if you wish to allow another user access to your AdWords account you would invite them to link through your account settings. However, when allowing an agency such as Keel Over access, the process is slightly different. Agencies or individuals who manage multiple accounts have an AdWords Manager Account, this allows them to view and manage their client’s accounts through their own Google Login without needing each individual’s account login details. In order to grant management access we first require your Customer I.D. (Account Number), this is the 10 digit number located in the top right of pages in your AdWords account. 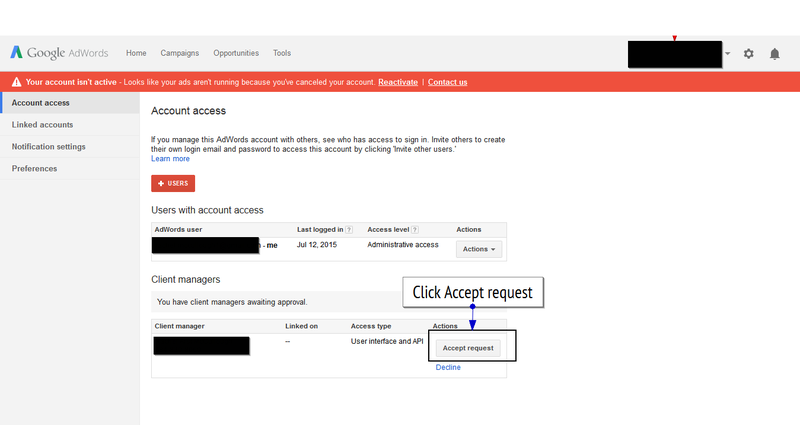 We will then send a request for access and you will receive an email and a notification of this request in your AdWords account. Select Account Access from the menu on the left-hand side of the page. Underneath the Client Managers heading in the centre of the page you will see a list of your current client manager’s as well as any pending invitations. To accept the invitation click the Accept request button which is next to the client managers name. You have now given Google Analytics and AdWords account access, meaning the manager can access them through their own Google email and password. Google AdWords continues to rule the Pay-per-Click (PPC) advertising market with an 88% market share of desktop searches in the UK. However, Microsoft Bing Ad’s are increasing challenging Google’s monopoly with a steady growth in popularity, which saw them pass the 10% mark in market share recently and makes advertising on Bing increasingly attractive. Bing is the now the default search engine on a multitude of devices, therefore if a user wishes to switch to Google’s search engine they have to do so manually, this accounts for its ever growing presence. With the ongoing rise in Windows powered mobile devices that 10% share will undoubtedly increase and the potential for worldwide Bing users is exponential, given that Windows 10 has been downloaded in excess of 67 million times already. A recent study of search engine users found that Bing is more popular with females and a more mature demographic (35 and over). This is good news for eCommerce sites who could see a greater ROI as this group tends to have higher earnings and therefore make higher value purchases. If this is your target market then there are very good reasons for advertising on Bing. Whilst Google AdWords benefits from a much larger audience, Bing has a lower CPC (on average 33.5% cheaper). This is because there is less competition for each keyword, plus fewer advertisers means that Click-Though-Rates (CTR) are likely to be higher. This is especially beneficial for businesses with a small PPC advertising budget and could be a factor when deciding where this money is best spent. If your products or brand is very visual then advertising on Bing could be advantageous. It has a unique Image Extension which allows photo’s to appear in-line with search ad’s meaning your products can be showcase in the most visually striking way. Inserting pictures is a sure-fire way of attracting more clicks enabling users to see exactly what you have to offer which is ideal especially when they’re searching for a specific product. Bing allows you to upload up to 6 images next to your ad-copy which could be very profitable given that 65% of people are visual learners. 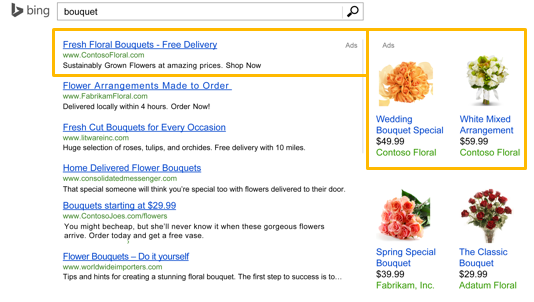 If you already use AdWords campaigns it is simple to expand into Bing. The Bing Ads menu has a category called ‘Import Campaigns’ with a drop-down where you can select ‘Import from Google AdWords’, making this task quick and simple! However, don’t rely on default settings if you want to make use of Bing’s unique features (e.g. Image Extensions), take the time to optimise your campaigns. Given AdWords market share it is natural that it is the first port of call for most PPC marketers, however Bing is increasingly growing in popularity and it would be foolish to completely ignore the potential of advertising on Bing. Spreading your Ad spend over both platforms will allow you reach more customers. Anticipating upcoming shifts and trends is vital for companies to stay one step ahead, this is especially true when planning a marketing strategy. In 2008 it was predicted that mobile would overtake fixed internet access by 2014 and indeed it did, the shift to mobile search naturally followed. The shift to mobile search increased year on year and in May 2015 Google announced that more searches were carried out via mobile than on computers in 10 Countries including the US and Japan. However, Google declined to provide any in-depth information on when the shift occurred or stats on mobile vs. computer searches. So what does this shift to mobile search mean for companies? It is more likely than ever that a consumer’s first interaction with your website will occur on a mobile so having a website that is clear, easy to use and fast when accessed on a phone is more vital than ever. It is therefore important that you have a mobile optimised website, as a user is unlikely to stay on, or return to your website if their initial experience is bad, in fact only 9% of users will stay on a mobile site or app if they can’t find what they want, it’s too slow or it doesn’t satisfy their needs. However, it is important to remember that the way people use the internet on their mobiles differs to how they use it on their computers. Searches on mobiles are carried out more frequently throughout the day however, the time spent browsing results and websites is likely to be far shorter. Hence, Google has said the shift to mobile search has created ‘Micro-Moments’. They suggest mobile searches fall broadly under 4 categories: ‘I want to know’, ‘I want to go’, ‘I want to do’ and ‘I want to buy’. In response a business needs to fulfill 4 vital criteria- ‘Be There’, ‘Be useful’, ‘Be Quick’ and ‘Connect the dots’. Search for the topics most relevant to your business on your mobile. Do you like what you find? Make sure your ad’s are still relevant to mobile searches and your website is still clear and easy to navigate. Whilst the purchase of goods or services is the ultimate goal it is important to be present for a broader range of consumer needs and curiosities. Mobile searches are more likely to be used for information gathering rather than purchases that doesn’t mean they don’t have value for your business. In fact, 51% of users have discovered a new product or brand when conducting a search and 1 in 3 have purchased from a company other than the one they intended because of the information provided in the moment that was needed. Users favour websites that contain concise, useful information when searching on a mobile rather than those pushing a sale. Mobile searches are often made whilst on the move so create customised location specific mobile ads to show you are nearby when they search for a specific product or service. In fact, 61% of mobile users say they are more likely to buy from a company that customises mobile information to their location. You have less time to make an impression on a mobile user so make your website as fast and user friendly as possible! Eliminate steps: by use one-step functions for sales and sign-in and display click to call buttons. Anticipate needs: Use previous customer behaviour and login data to customise future experiences. Load fast! 40% of shoppers will wait no more than 3 seconds before abandoning a retail site. It’s important to remember that you don’t have mobile, P.C or In-store customers, you just have customers. They may experience your company across any or all of these mediums before they make a purchase decision. It is important that their experiences are positive whichever platform they choose. They may gather information from your website before making a purchase in your store, a poorly designed and slow website may lose you this sale even though it is not completed on your website. All interactions are valuable even if they don’t provide immediate results.